Vicente del Bosque is a Madridista. A massive Madridista. And, for that reason, there are no doubts. No questions. In addition, he led Spain to a World Cup and European Championship. He is, it's fair to say, an example. For the Madrid media cavern, I am referring to. For that reason, some were surprised to hear his comments about the Ballon d'Or when speaking to Manu Carreño. 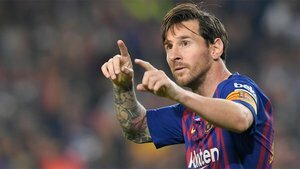 In the epicentre of Madridismo, the former Bernabeu boss said that he cannot understand how Lionel Messi is not among the (reported) three finalists for the prize which rewards the best footballer of the year. "It loses all value if he's not there," Del Bosqur said. He said it knowing that Luka Modric and Cristiano Ronaldo are supposed to be on the podium, two emblems of Madridismo. And he said it because he's a normal, intelligent guy who understands football without bias.